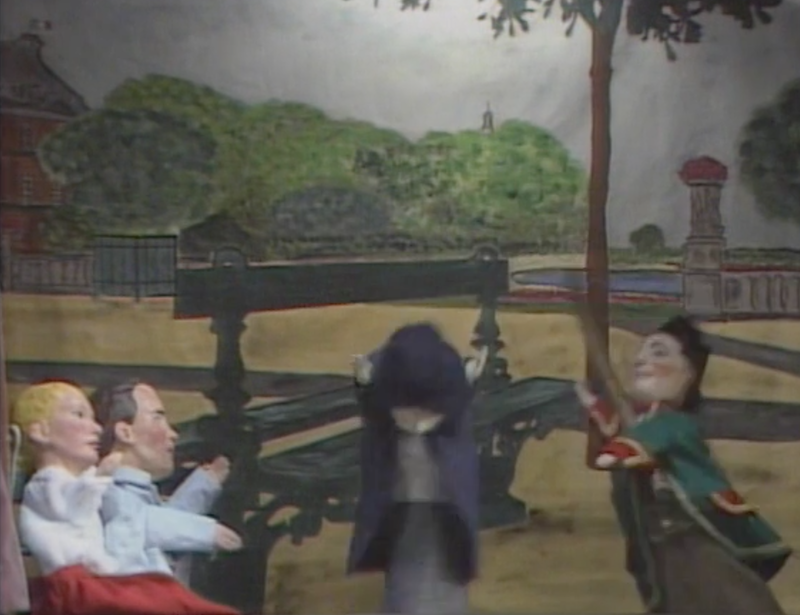 At the end of every episode of French in Action is a brief scene from a puppet show - a puppet show grand Guignol - and the French apparently think Grand Guignol is OK for children. There's a nasty little man-puppet in almost every scene and he is usually accompanied by his baton - a stick he uses to beat everybody with, including the two puppets portraying the stars of the French in Action romantic comedy, Mireille and Robert. In this screen cap he's beating a third puppet. Damn he's a creep. Guignol is the main character in a French puppet show which has come to bear his name. It represents the workers in the silk industry of France, Europe. Although often thought of as children's entertainment, Guignol's sharp wit and linguistic verve have always been appreciated by adults as well, as shown by the motto of a prominent Lyon troupe: "Guignol amuses children… and witty adults". I translated the title of this blog post for you: "Mr. Guignol is a bad showerbag to everyone." The word "douchebag" loses something in the translation. Sans doutes je dois apprendre le français! MERRY CHRISTMAS HEAVENS TO MERGATROYD VISITORS! How much does the alt-right love Steven Pinker?